Updated Thursday December 27, 2018 by Bret Lavey. The South Lexington Youth Baseball organization dates to 1956 when it was founded under the name of the Southern League. In the early 1970s, the Southern League, by that date called Southern Little League, merged with the Stonewall Independent League under the banner of South Lexington Little League with a 10-team Major League division and several Minor League teams. For 62 years, SLYB built a tradition of excellence playing on 60' basepaths (46/60). In 2019, SLYB made the switch to 70' basepaths (50/70) with 9, non-divisional teams. Over the years the Minor League has expanded to about 8-10 teams annually and in the 1990s the Rookie League (now 7 and 8-year olds with about 11-14 teams annually) and Tee Ball (now 3 to 6-year-olds with 16-22 teams annually) comprise the league’s make-up. During 1970's , South Lexington won several Little League State championships and in 1978 South Lexington’s 12-year-old All-Star team won the South Regional to become one of only four United States teams to qualify for the eight-team Little League World Series in Williamsport, PA. South Lexington won two of three games in the World Series to finish third. In the mid-1980s, the league became affiliated with Babe Ruth Baseball, playing in the Bambino Division, now called Cal Ripken. Success on the national and international stage in several age divisions has continued for South Lexington teams in the Ripken Division. Sixteen different South Lexington’s 12-year-old All-Star teams have gone to Ripken (or its Bambino predecessor) 60' Diamond World Series. The teams in 1992, 2001 and most recently 2007 won World Series championships and the 1994 and 2011 teams finished as the runner-up in the Series. The 2008, 2009, 2010, 2013 and 2014 teams finished in the Ripken World Series’ Final Four. Also, South Lexington’s 12-year-old teams in 1987, 1988, 1990, 1997, 1999, and 2000 also participated in Ripken (or Bambino) World Series. In 2018, SLYB sent an all-star team through the 70' Diamond Cal Ripken Tournament trail and earned a trip to the World Series in their first 50/70 play. In the 10-year-old Cal Ripken World Series, three South Lexington All-Star teams have participated. Most recently, the 2013 South Lexington 10-year-olds finished as runner-up in the World Series just as the 10-year-old age group did in 2004. 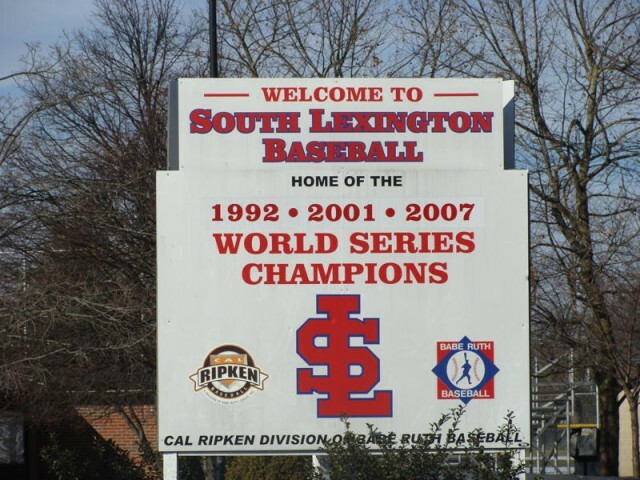 South Lexington’s 10-year-old All-Star team also appeared in the 2009 World Series. After the Southern and Stonewall leagues merger in the early 1970s, SLYB began with the current format, playing with 10 teams in the Major League. This league was divided into two five-team divisions, the American and National divisions. For nearly 30 years, the league champion was decided in a best of three playoff between the two division winners. An alteration to this was made beginning with the 2002 season when a tournament was initiated. For the regular season, the same two-division format was maintained and the team with best record in each earns its division championship. The post season tournament is a separate entity and consists of six teams who earn tourney berths off regular season performance. The division winners receive the No. 1 and No. 2 seeds in the tournament and a first-round bye. The next four teams with the best records qualify for the other tourney spots. Beginning in 2019, SLYB moved to a non-divisional format with a sole regular-season champion and the next five teams with the best record qualifying for the tourney. Following is some historical information on the regular season and league post-season play. Over the years, team names have changed and the division make-up has been altered. 1974-Yankees defeated Rebels 2 games to 1. 1975-Rebels defeated Braves 2 games to 0. 1976-White Sox defeated Cardinals 2 games to 0. 1977-Cardinals defeated White Sox 2 games to 1. 1978-White Sox defeated Wildcats 2 games to 0. 1979-Rebels defeated Braves 2 games to 0. 1980-Wildcats defeated White Sox 2 games to 0. 1981-Braves defeated Cardinals 2 games to 1. 1982-Wildcats defeated Braves 2 games to 0. 1983-Wildcats defeated White Sox 2 games to 1. 2001-Cardinals defeated Cubs 2 games to 0. Cal Ripken, Jr., former major league star with the Baltimore Orioles, became affiliated with Babe Ruth Baseball, Inc. in 1999 and Babe Ruth’s 4 to 12 -year-old age division changed its name from Bambino to Ripken that year. In 2007, Ripken baseball began offering two different distances for which its league members could complete, those being at 46/60 foot division and 50/70 foot division. A 12-year-old World Series is held annually for each division.